My name is Ivy Weinglass. I’m very nervous to call myself a ceramicist, but I make ceramics and other crafts. My name is Ivy and I’m crafty. I’ll leave it at that. I have made quilts in the past. I’ve made clothes. I’ve done fine arts. I’ve done a lot of different things; usually I try something, figure it out, and move on. Ceramics is the one thing that I haven’t moved on from yet and I don’t think that I will for a very long time. I like the aspect of literally molding something; you take a ball of clay and you make something with it. I love the tangible aspect of it. I love the multiple stages of it. I love how you can’t think of anything as precious because things break and crack. It is not a medium for the faint of heart; you really have to learn how to let go of things and be surprised and be patient and be open to the final outcome, however it turns out. You can either go with it or throw it out and move on. Ceramics has taught me how to be way more patient, way more understanding and way more relaxed. I used to have really bad anxiety and it has really helped with that. There is a sort of meditative aspect to it. I love the process and I also love what comes out of it. It’s really cool to think that my hand has been a part of all of these things; I like the aspect that I made every single thing in this room or in my studio. I think that I need a little bit of pressure. I need something anxiety-inducing, like needing money or figuring out how to live off of this. But I also need the freedom to be able to come in and play. In the past two holiday seasons, the second that Christmas is over I get so tired because I feel like I’ve been a machine. Then in January and February I get inspired again. This whole new Canyon Collection has been a product of me getting to relax and not worry about selling a lot of stuff; I can just sit back and play. It’s kind of this mix where I need to be able to play without the thought of making money, but I also can’t be too relaxed since this is what supports my life. I need to feel both of those things. I don’t know, that’s a good question. I think that my daily activities of getting up, making myself a cup of coffee and getting going are my rituals. I come to the studio and usually spend about twenty minutes doing little things like putzing around on my phone trying to figure out the best podcast to listen to. Then I sort of just lose myself in the work for a while. Sometimes I have to take a step back; I need to be able to step back from it in order to delve deeper. I like going really hard for a few hours and then taking it a little easy by buying myself a nice lunch or just getting a cup of tea and taking a walk in order to clear my mind. But in terms of my life, I definitely have a lot of rituals. I always have candles burning; I’m really into scents like palo santo and incense. That’s actually why I originally started making the ceramic hands; I needed somewhere to place all of my palo santo. It depends on what I’m making. I make almost everything to order. If I get an order, I’ll write it down in my notebook - not on the computer, I know that I should, but I’m so much better when I handwrite things - and then I go into the studio and sign up for the kiln. With certain items, like the hands, I usually have a few of them in backstock. Since the hands are so small I’ll make a ton of them at once; I can fit a hundred or so in the kiln. Now that I have more studio space I can store a lot more, but in my old space I didn’t have enough room for storage. I am in this kind of weird spot, it’s an interesting push and pull between having enough and not having too much. I usually give myself a week of making stuff. I come in and start with making the exact amount that I need to fill an order, and then from there I usually make more, make other things or play around if I have time that week. Then I fire the pieces and glaze them a week after. So it’s one week of producing and then a second week of glazing and firing. The second week requires a lot less time in the studio, but even when I’m not here, I’m still working. I’ll be on my computer emailing people and running errands for the business. I basically never stop working. I try to do something every day, even on the weekends, to make myself feel like I’m furthering the business in some way. It can be hard sometimes, it’s definitely tiring. I have to learn how to relax a little and take some time off. That is not the easiest thing for me. Do you use any tools that you use that you consider to be extensions of your hands? 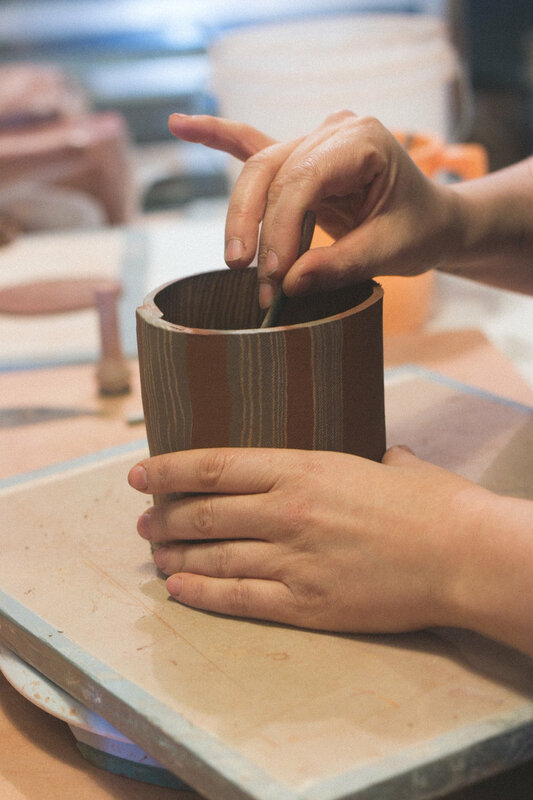 A bucket of water and a sponge are so important because you don’t want things to get too dried out, especially when you work on a few pieces at once. But a simple metal point tool is the most important; it is what I draw everything out of. 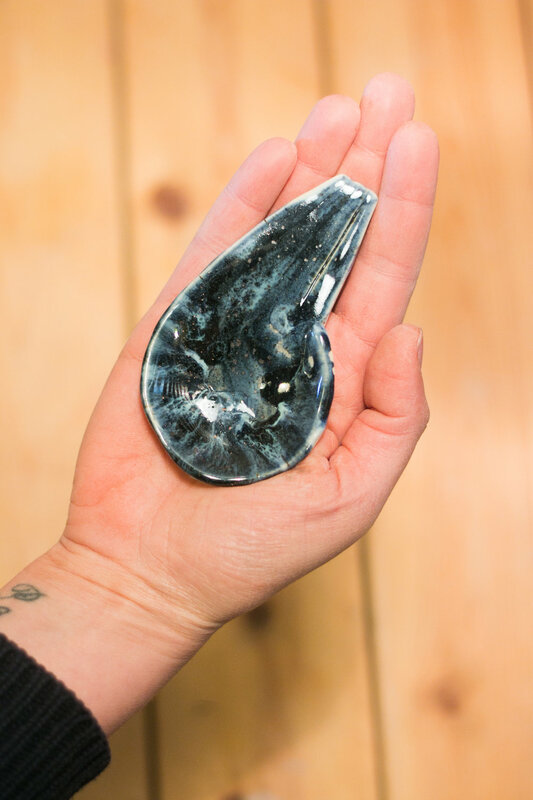 To make the hands, I roll a slab of clay out into about a half-an-inch, then I take a finished hand, place it on top and cut around it with the tool. That is why every single one is different. People have asked why I don’t get a cutout or a cookie cutter. Maybe that would save me ten minutes, but I personally like molding each hand by hand. What thematic roles do symbols and nature play in your work? Oh my god, so much. For years, ever since I can remember, any time I would go thrifting and I saw a hand I would buy it. I have so many hands. Since I’ve always been drawn to hands, I knew that when I started playing with clay I wanted to make myself something hand-shaped. So hands have always always been a part of my story. I’ve also always been obsessed with the Grand Canyon and nature vistas. An Americana road trip is my idea of the most perfect trip there ever was. Some people want to go to Europe, and I just want to drive around America for a few months. Last summer I went on a trip up Northern California into Oregon and it was the most beautiful place ever. I definitely came back really jazzed. The Canyon Collection kind of played on this idea. 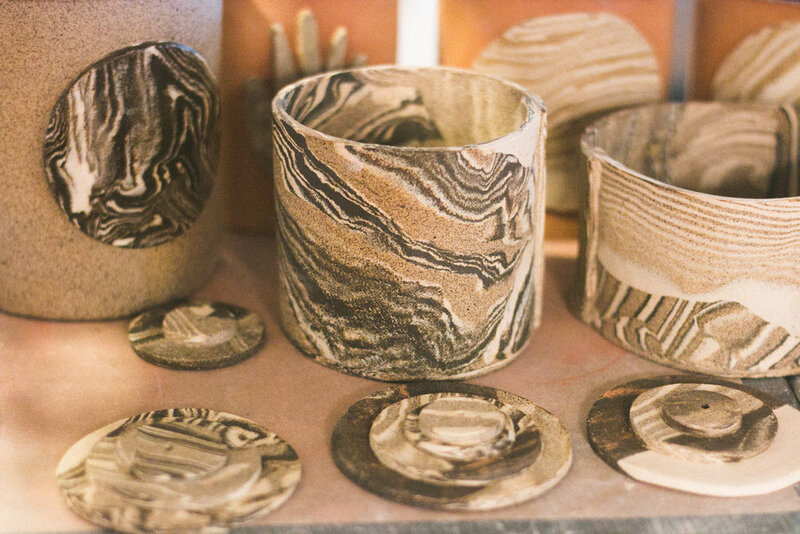 I found a YouTube video of someone making a teapot with all of these clays swirled together and thought it was a cool idea that I could play with. I wanted it to look like the Grand Canyon or Antelope Canyon with years and years of eroding sandstone. That’s why I love not glazing the pieces; you feel that it’s earth and that is so awesome to me. It’s interesting that I live in New York and that all I want to do is be in nature. I’m so inspired by nature and just want to get there, so daydreaming and making these pieces is a way of doing it myself. Since I can’t necessarily find the time for it or afford a three month long American road trip, I make nature come to me. Inspiration is very interesting because sometimes you don’t necessarily know where it came from until after you’ve made something. As silly as it is, I recently bought a circle template and realized how much I love circles. I bought it thinking that it would be helpful one day and now I’ve noticed that my whole collection has circles. It sounds so silly to say that I am interested in circles, but I am. It really just came from playing with that template piece. That is what is really important about being able to play with no end result in mind, and being able come into the studio and spend a few days just making a bunch of mistakes and making a bunch of really weird things. You have to be able to work with no agenda for awhile in order to work out your agenda. But also, I have learned more and more that you can’t force inspiration. There are days where I come to the studio and know that I am going to make a lot of crap because I am not feeling it. Sometimes it is better just to remove yourself and give yourself a day off rather than try to force something if it’s not going to happen. I think that it is really important, especially with inspiration, to listen to what it is telling you because we are so easily distracted and we are always trying to force ourselves into these states. It’s easy to think that you are supposed to be inspired constantly and creative constantly, but the reality is that you just can’t. Eventually you just have to accept that and know that it will come again. It’s like writer’s block. Sometimes you just have to not make something for a little while in order to make something amazing in two weeks. Like anything, the more you do it the better you get. I still have so much to learn, and a lot of it I’ve just sort of fumbled through. I have made a ton of mistakes, but I’m definitely getting better. I’m getting more knowledgeable about how things work. Even just little things like learning to wait an extra ten minutes for a piece to dry before working on it, you just learn without even realizing you are learning. It really is a matter of just paying more attention to the material. Also I think that with every year that goes by you take yourself a little bit more seriously. And so it’s a nice feeling to sort of validate yourself in that sense and say to yourself I’m still here, I’ve just moved into a great new space. Cool, okay. Just keep going. It’s one of those things where you just keep pushing and seeing how much further you can go. Definitely. I mean with the actual learning of ceramics I took my first class at Choplet Ceramics Center, which is in Williamsburg. I definitely learned a lot there. But more generally in terms of being an artist, I would say my mom has been really inspiring to me. She is a writer, and she’s never stopped being an artist her entire life. Also, I worked as a prop stylist for a really long time. The stylist that I worked for, Andrew, definitely taught me - this is going to sound weird - a lot about beauty. I don’t even know how to describe it, but he taught me how to see objects and colors in a different way than I had before. I have always been a hoarder and I’ve always ascribed magical properties to certain pieces. But I don’t think that I had ever viewed objects as simply beautiful objects. That has been very, very important for me. 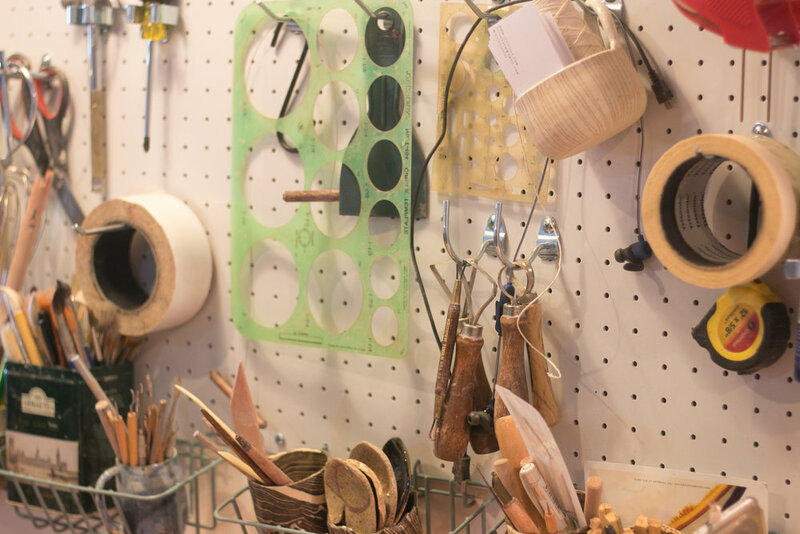 Has your work in other fields or disciplines other than ceramics informed your practice in any way? Oh yeah, totally. I went to school for marketing and media and then I worked in music marketing for a little bit. Then I worked as a stylist, in both fashion and prop styling, for a while. My marketing experience has been great in that I can kind of do my own marketing, not that I’m the best at it but I kind of have a little more of an idea about what to do. And prop styling gave me an eye for things. Sometimes I’ll look at a mug that I have made as almost an extra arm because it feels so me, but I also think that I’m able to sort of step back and and recognize when something is actually good too. It’s nice to be able to have that vision. I also do my own photography; I make my little props styling set-ups. So the little things that I picked up along the way are invaluable, and knowing the ins and outs of that stuff is great. When I started selling my work I would just write my name, Ivy, on the bottom like a five year old. Eventually I thought that I should really try to make it look a little more professional. So I started to think about what my business name should be, and I kind of just wanted it to be Ivy. So it really is just that, Ivy. For the logo I had my dad help me put something together. I had an idea that I wanted IIIVVVYYY to be written in a circle, so he just went on his computer and did a bunch of cool stuff and then I picked one design and made a clay stamp of it. I’ve been using it ever since and am still confused about what my name is, or how you say it. But as far as the logo, my dad did an great job and I love it. It’s very simple and I feel like it works nicely because it’s so plain. It lets everything else speak for itself. Sometimes I’m making so many hands that I forget to stamp a few, and I don’t sell those. I like having a stamp on each one, it just feels finished and it adds a sort weight of professionality to the work that sometimes I feel like I lack just in my personal being. The day the clay stamp came was actually the first time that I felt like maybe this was a legit business. I think that it definitely has a 1970s California vibe, which I’ve always been very drawn to aesthetically. I mean, my room looks like wicker furniture threw up in there. I’ve always been super into that look and definitely in my mind I’m a lot more 1970s California looking than anything. I always think that my pieces would just be so perfect in a cabin by a lake in that era. So I don’t know if that’s the story that the work tells, but that’s the vibe that I get from it. What do you hope that your ceramics will bring into your customers’ lives? That’s actually something that I’ve been really thinking about since the election. I have been asking myself what I am doing to help the world, and it’s sad that such a horrible thing had to make me think about that. But it did. It didn’t make me question my work but it definitely made me pause and consider whether I am adding to the world in any way and whether people people want this kind of work in times that are difficult. Ultimately I decided that people want art, people want beauty, people want items that can bring them some sort of joy. I also donate a lot. I’ve done a few little collaborations, one involving some embroidery and for another I made this candle with my friend. We donate twenty five percent of the embroidery and then we donated one hundred percent of the candles. I think that it’s very important in 2017 to know where you’re spending your money and to make sure that it aligns with what you want to see in the world. So for me, I think that it is important to let people know that I definitely have a social conscience. But in terms of my actual work, I think that in 2017 I hope that it can bring - this is going to sound so schmaltzy - a smile to your face. That’s what it brings to me. And I want people to be able to give them as gifts. I think that, especially right now, being able to give gifts and give love is very important and I hope that people use my work for that. Like with the hands, to give somebody a hand is such a great sentence in my mind. I hope that people treat each other with a little extra kindness this year and all the years coming. I know that I will try to. There are multiple challenging aspects. Just making sure that I am making enough money to live doing this full time is really hard. Sometimes I am and sometimes I really am not. The money is always a source of stress and I wish that it wasn’t because I could kind of care less about money. I just want to make enough to survive and pay my rent and not feel nervous about it all the time. But I’m am also really in love with what I do and I wouldn’t give it up for a job where I made a lot of money. I’m going to keep doing it until it’s painfully obvious that I can’t keep doing it. And for the moment, I’m really trying and I’m succeeding somewhat. Also the daily shipping is challenging. I’m constantly running around with tons of bags. I do everything in this world of mine, which is a blessing and a curse. Sometimes it gets very overwhelming and exhausting, and sometimes I just wish that I could have a partner in the business who could figure out the money thing and I could just keep doing the creativity stuff. But I like doing it all. I like having my hand involved in every single aspect of it. So those are the two things that are definitely the most challenging. The easiest part is making stuff. Nothing brings me more joy than being in the studio and making stuff. Even when I’m on my hundredth hand of the day and I just feel like I’m going crazy and I’ve listened to too many True Crime podcasts and I’m sure that I’m going to get murdered, I’m still so content. I can leave for the day thinking, You know what? You are living your dream, as silly as that sounds. So even with all the anxiety of being a small business and trying to make a life off of small expensive work, it is ultimately really rewarding. I’m a horribly impatient person, it’s the thing that I really dislike about myself. Ceramics has taught me patience and it has taught me how to roll that over into other aspects of my life. So that’s definitely the biggest thing. And then just when I’m sad or if I’m feeling depressed or worried, getting my hands dirty and messy and making something tangible even if it cracks or even if I hate it at the end of the day, calms me down to no end. It feels really wonderful to be able to make something with your hands. It’s really important to me. They’re definitely more dry than usual, and I have to keep my nails really short. But I used to have a lot of anxiety, the majority of which I know was from birth control. The medical industry has not given enough thought to what birth control actually does to women’s bodies. So I used to have this horrible anxiety and I would feel it in my hands. They would start tightening up and curling into themselves. I think that both going off of birth control and working with ceramics has helped that a lot. It gives me a way of being able to use my hands and stretch them out. Constantly moving them takes my mind away from the anxiety, which I don’t always feel anymore. Actually, this election actually brought up a lot of anxiety for me. I hadn’t felt that kind of anxiety in years. But in coming here and working in the studio, my hands relaxed. Ivy Weinglass in Brooklyn, New York on February 17, 2017. Photographs by Caroline Wallis.